Nitrogen deficient plants grow slowly and fruit yields are reduced. Leaves are small and uniformly light to yellowish green (chlorosis). Deficiency symptoms first appear in older leaves, but rapidly move to younger leaves (see pictures). Symptoms can be corrected quickly by adding mineral N fertilizer. Symptoms of N deficiency in younger leaves may also include purple veins [N18]. Purpling of N deficient plants is caused by insufficient P uptake when N is limiting. 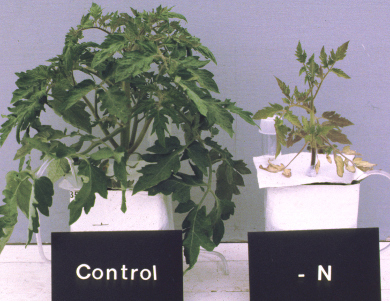 Hydroponic tomato plants supplied with all nutrients (left) and with a nutrient solution deficient in N (right; photo provided by Jim Richards, UC Davis). Nitrogen deficient tomato leaf (photo provided by Jim Richards, UC Davis). Excess N results in lush plants with dark green foliage and delayed maturity. Plants may be more susceptible to disease and insect attacks. In addition, fruit quality may be affected [N9]. Soil samples for nitrate analysis should be taken before the first N application of the season, either before planting or before the first in-season N application. Tomatoes have a relatively shallow root system, with most roots growing at a depth of 4 to 16 inches [N3, N12]. Therefore, samples are generally taken to a depth of 1 to 2 feet. Due to the variability of nitrate in the soil, care must be taken that the sample is representative for the field (see Sampling for Soil Nitrate Determination). The soil nitrate test measures the plant available N at the time of sampling. Its level depends on a number of factors (see Factors Affecting Soil Nitrate Concentrations in Spring). Therefore, the test result is field specific and needs to be determined every year. Nitrate is directly available to plants. The nitrate present in the rooting zone can therefore be subtracted from the crop N requirements to determine the amount of fertilizer N that needs to be applied. Contact your local farm advisor for more information. In a FREP-funded study carried out at various sites in California, a yield response of furrow-irrigated tomatoes was unlikely when the pre-sidedress nitrate-N concentration in the top 2 feet of the profile was above 16 ppm [ N10, N13]. This concentration corresponds to approximately 115 lbs N/acre at a bulk density of 1.35 g/cm3. 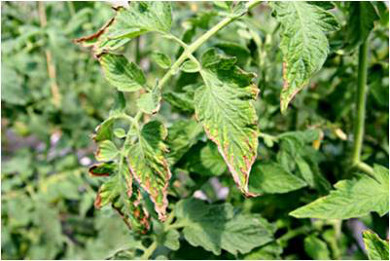 Tissue N analyses are generally not taken before early flowering because N deficiency is uncommon before flowering [N5]. Whole leaf analysis provides a more reliable estimate of crop nutrient status than petiole analysis because it measures all forms of N and because the N concentration in the leaves changes more slowly than in the petioles, making the result less dependent on the exact sampling date [N4]. The fourth leaf from the growing tip is generally sampled [N11, N14]. For a representative sample, some 40 leaves should be sampled. Samples should be placed in a clean paper bag and dried at a temperature of 140-160 °F [N11]. For more information on sampling procedure see Plant Tissue Sampling. A team led by Tim Hartz[N6] conducted a survey of more than 100 commercial fields. The optimal nutrient concentrations for high-yielding processing tomatoes are reported in the table. Leaf nutrient concentrations within these ranges can be considered sufficient for the growth stage; the farther outside these ranges the measured concentrations are, the more likely it is that N is deficient or available in excess [N5]. Optimal leaf nutrient concentrations for high-yield processing tomatoes [N6] (To convert the concentrations to %, divide the numbers by 10). Tomato plants take up less than 30% of their N before fruit set [N2]. Therefore, most pre-plant N needs to remain in the root zone for a relatively long time before plants take it up. This increases the risk of N leaching below the root zone, especially in furrow irrigated systems. Taking into account residual soil nitrate, the need for pre-plant N is often minimal and a starter N application is likely more efficient. Applying moderate levels of N before or at planting (max. 30 lbs/acre) and applying the rest during the growing season minimizes the risk of N losses. Hartz and coworkers[N7] reported N application rates at transplanting in commercial fields ranging from 5 to 15 lbs/acre. High rates of starter N are generally not necessary, because the N demand is moderate before the onset of fruit growth [N2]. For easy access by growing roots, starter fertilizer is best placed in a band 1 to 2 inches below the seed. Fertilizer located 2 inches to the side of the seed line is less efficient. For transplants, the placement of the starter fertilizer is deeper and can be slightly offset to the side so that it can be reached by roots growing out of the root ball [N15]. Solutions containing N and P, such as a 10-34-0 solution, are most often used [N15]. Starter blends containing N and P can assist in P uptake leading to better root development. For drip-irrigated processing tomatoes, Hartz and Bottoms[N4] found that a seasonal rate of approximately 175 lbs N/acre is adequate to maximize fruit yields in most soils. Contact your local farm advisor for more information. Krusekopf and coworkers[N10] carried out a study in the Central Valley in ten furrow irrigated fields. A response to N fertilization was observed in only four fields. In the responsive fields, no significant yield increase with sidedress N application rates above 100 lbs/acre was observed. The total available N in these fields, which included the pre-sidedress nitrate-N in the top 2 feet of the profile and the sidedress N, averaged 170 lbs/acre [N10]. Based on this and other studies, the recommended seasonal N application rate for furrow irrigated tomatoes is 100-150 lbs N/acre [N8]. Fertigation is the preferred mode of application in drip-irrigated systems. Fertigation allows synchronizing N additions with plant demand. Sidedress N to furrow or sprinkler irrigated tomatoes is most often applied in a band. Krusekopf and coworkers[N10] reported applying sidedress N to a depth of 6 inches and at a distance of 6 inches from the plant row. Tomato plant can take up ammonium as well as nitrate. Research has shown that tomatoes are sensitive to ammonium nutrition, especially during flowering and fruit initiation and when the light intensity is high [N9]. However, under field conditions in California, ammonium is quickly converted to nitrate, so that ammonium toxicity is of no concern. Most of the seasonal growth and N uptake occurs between early fruit set and the early red fruit stage [N1, N4]. For maximum effectiveness, sidedress N and N fertigation should be timed to maintain an adequate N supply during this period of high N demand [N4]. The amount of N taken up after the early red fruit stage is minimal, as the N demand of the fruits is met with N translocated from the leaves and stems [N2, N4]. Therefore, N applied after the first fruits turn red likely remains in the soil and may be leached or denitrified during the winter. For drip-irrigated tomatoes, there is generally no need for foliar applications, as N can be fertigated throughout the season to meet N demands. To furrow irrigated tomatoes, foliar N is most often applied to correct for insufficient N supply late in the season when sidedressing is no longer possible. However, with proper management of soil applied N, the supplementation with foliar N has generally no benefit for processing tomatoes [N15] . If a foliar N application is considered necessary, a relatively dilute solution needs to be applied, as tomato foliage has a relatively low tolerance to urea [N17]. To prevent leaf damage, a urea-N concentration of 4-6 lbs/100 gallons has been recommended [N17]. This is in line with Tan and coworkers [N16], who did not find leaf injury with urea-N concentrations of 4.2 lbs/100 gallons, while doubling the concentration resulted in leaf damage. With an application volume of 100 gallons of water per acre, about 5 lbs/acre of urea-N can therefore be applied with a single foliar application. For foliar applications, the risk of leaf injury is lower with urea than with ammonium or nitrate solutions [N16]. Fertilizer companies recommend applying foliar N in intervals of 2 to 3 weeks with the first application at bloom stage. The growth of P deficient plants is slow, resulting in stunted plants. Growth is especially slow under cool weather conditions. Leaves of P deficient plants turn dark green and the tissue on the underside of the leaves between the veins becomes purple (see pictures). Stems and petioles may also become purple in color, while older leaves turn yellow [P1, P22]. Under cool conditions, P uptake is generally slower, which may result in P deficiency symptoms despite adequate soil test levels [P15]. While the optimal soil pH for tomatoes is between 6.2 and 6.8, tomatoes will grow well in soils with a higher or lower pH [P14]. 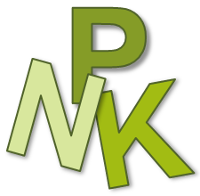 However, P availability is severely reduced in acidic and alkaline soils. Under these conditions, P deficiencies are better corrected by adjusting the soil pH, rather than by applying large amounts of P fertilizer. 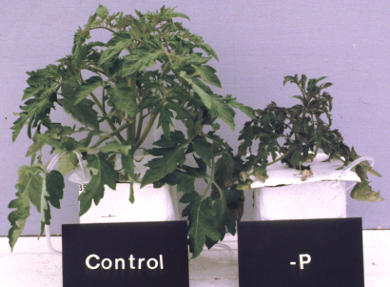 Hydroponic tomato plants supplied with all nutrients (left) and with a nutrient solution deficient in P (right; photo provided by Jim Richards, UC Davis). 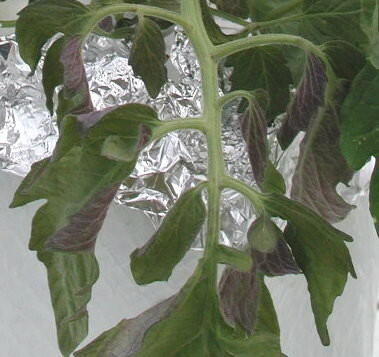 Phosphorus deficient tomato leaf (photo provided by Jim Richards, UC Davis). Excess P availability may interfere with the uptake of iron and zinc, causing deficiencies of these micronutrients [P15]. However, nutritional stress in tomato plants was observed only when the P level in leaves exceeded 1% of the dry matter [P14]. Tomatoes have a relatively shallow root systems with most roots growing at a depth of 4 to 16 inches [P6, P17]. Therefore, samples are generally taken to a depth of 1 to 2 feet. Soil samples are generally taken in fall or spring (see Soil Test Sampling for sampling instructions). For subsurface drip irrigation systems that have been in place for multiple years, P availability in the zone around the drip tape can drop considerably. It is therefore important to sample the wetting zone for an accurate assessment of soil fertility [P7]. In California, the available soil P is generally determined by extracting the soil samples with a bicarbonate solution (Olsen-P test). The Olsen-P test works well in soils with pH 6.5 and above. Consult your local farm advisor for appropriate soil testing when soil pH is below 6.5. Soils with Olsen-P values greater than 20 ppm are unlikely to respond to P applications, although a temporary early growth response to pre-plant or starter P may be observed [P12]. For Olsen-P values between 10-20 ppm, Hartz and Hanson [P9] recommend applying the amount of P removed with the harvested fruits (see Table). With a yield of 50 tons/acre, approximately 25-35 lbs P/acre are removed with the tomatoes [P3, P4, P9]. For Olsen-P values below 10 ppm, the application rate may be increased to meet the plant’s total uptake, which may reach 27-44 lbs P/acre [P3, P4, P9]. Regular soil analyses indicate whether the P fertilization program is adequate. On the long term, the Olsen-P values should reach and remain in the optimal range of 10 to 20 ppm. Recommended P application rates to high-yielding processing tomatoes (adapted from [P9]). 1) A small amount of starter fertilizer may be applied to promote root growth, especially when the soil temperature is low. Nutrient concentrations of whole leaves are a more reliable measure of crop nutrient status than concentrations in petioles [P7], as petiole nutrient concentrations may change very rapidly, making them heavily dependent on the sampling time [P8]. The fourth leaf from the growing tip is generally sampled [P16, P18]. For a representative sample, 40 leaves should be sampled from a field or management unit. Samples should be placed in a clean paper bag and dried at a temperature of 140-160 °F [P16]. For more information on sampling procedure see Plant Tissue Sampling. The table gives the ranges of leaf nutrient concentration typical of high-yield processing tomatoes. The values were obtained with a survey of more than 100 commercial fields [P10]. Leaf nutrient concentrations within these ranges can be considered sufficient for the growth stage; the farther outside these ranges the measured concentrations are, the more likely it is that the nutrients are deficient or available in excess [P9]. Contact your local farm advisor for more information. Optimal leaf nutrient concentrations for high-yield processing tomatoes [P10] (To convert the concentrations to %, divide the numbers by 10). The optimal P application rate depends on the soil test analysis (see Table). The values in the table refer to total annual application rates, including P applied at a later date, e.g. as starter fertilizer. Regardless of irrigation technique, most pre-plant P is applied in a band [P12, P19]. Transplanted tomatoes achieved higher yields when P fertilizer was applied in a band at transplanting compared to a broadcast application [P2, P20]. In a field study with direct seeded tomatoes, Hipp found that banding triple superphosphate was more effective than broadcasting it [P13]. Phosphorus uptake was highest when P was banded to a depth of 2 inches directly underneath the seed or not more than 1 inch to the side[P13]. Triple superphosphate and other soluble P fertilizers can be used. Pre-plant P is best applied in spring after preparing the beds. In a study with field-grown fresh market tomatoes, Grubinger and coworkers found that a starter fertilizer application of 8.4 lbs/acre (19.5 lbs P2O5 /acre) had a positive effect on leaf P concentrations and total yield on a soil testing low in P that did not receive any pre-plant P [P5]. However, no benefits from starter fertilizer were obtained on a soil with high residual P that was moderately fertilized with P before transplanting or on a soil with low residual P that was heavily fertilized with P. Therefore, in fields with high soil P test levels (see Soil Test), starter P may not increase yield. For transplant production in the greenhouse it is a common practice to withhold P fertilization to control transplant height and growth rate. When delivered, transplants may be P-deficient. Even if they are to be transplanted into a field with high soil test P, a pre-transplanting drench or at-transplanting ‘starter’ P application is prudent [P9]. Hartz and coworkers (2002) reported P application rates at transplanting in commercial fields ranging from 8 to 18 lbs P/acre (18-41 lbs P2O5 /acre) [P11]. Contact your local farm advisor for more information. For easy access by growing roots, starter fertilizer is best placed in a band 1 to 2 inches below the seed. Fertilizer located 2 inches to the side of the seed line is less efficient [P19]. For transplants, the placement of the starter fertilizer is deeper and can be slightly offset to the side so that it can be reached by roots growing out of the root ball [P19]. However, when the fertilizer concentration exceeds 2 gallons per 100 gallons of solution, applying the solution too close to the seeds or transplants may have a toxic effect [P21]. Solutions containing N and P, such as a 10-34-0 solution, are most often applied using 400 gallons of water per acre [P19]. With an adequate pre-plant or at-planting P application, in-season P fertigation is seldom necessary [P12]. Although P fertilizers can be applied through drip irrigation (with proper safeguards to prevent chemical precipitation), fertigation may not be the best way to apply P. Normally, P supply is most limiting early in the season, when the soil is cooler and the root system of the crop is still small. For this reason, P is generally applied pre-plant or at planting/transplanting [P9]. Phosphorus is most often applied pre-plant and as starter fertilizer. Supplemental foliar applications have been found to have little economic benefit and impact on processing tomato production [P19]. When K is deficient, the tips and edges of older leaves turn yellow (chlorosis). Symptoms progress to the leaf tissue between the veins. As deficiency intensifies, chlorotic tissue becomes brown and dies (necrosis) and the leaves tend to curl and crinkle [K23]. Leaves showing K deficiency symptoms appear “burned” along the edges. Because potassium is easily translocated from older to younger leaves, the latter only show symptoms under severe deficiency. Fruits of K deficient plants show color development disorders, such as yellow shoulder and internal white tissue. The fruits ripen unevenly and appear blotchy [K23]. High magnesium (Mg) availability may increase the risk of fruit color disorders [K10]. When the soil is very wet, K uptake is significantly reduced, which can lead to insufficient K supply despite adequate exchangeable soil K levels [K15]. 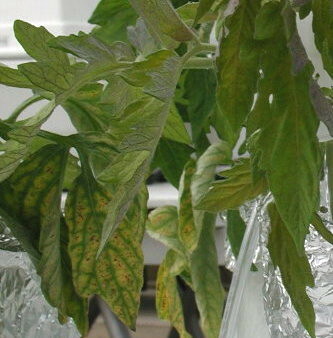 Potassium deficiency symptoms on tomato leaves (photo provided by Eric Sideman). 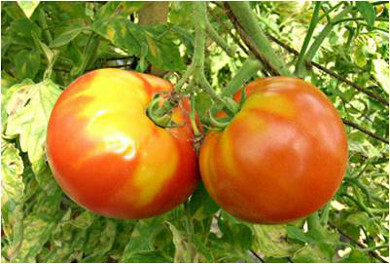 Yellow shoulder of tomatoes may be caused by K deficiency (photo provided by Eric Sideman). Eric Sideman’s tips for K fertilization of organic tomatoes can be found here. Excess K availability may interfere with the uptake of Mg and calcium (Ca). Very high K availability may result in Mg or, in some instances, Ca deficiency [K15]. Tomatoes have a relatively shallow root system. Even though some roots can be found below a depth of 3 ft [K13], the root density below 16 inches under either surface or subsurface drip irrigation is very low [K19]. Hammanmi and Daghari also found about 85% of the roots between a depth of 4 to 16 inches before harvest in a surface drip irrigated field, while less than 5% of the root biomass was below 16 inches [K3]. Therefore, for the determination of exchangeable K, only the top foot or two of the profile is generally sampled. Samples are generally taken in fall or spring (see Soil Test Sampling for sampling instructions). Soil exchangeable K is determined on ammonium acetate extracts. For subsurface drip irrigation systems that have been in place for multiple years, nutrient availability in the zone around the drip tape may considerably differ from bulk soil. It is important to sample the wetting zone around the tape for an accurate assessment of soil fertility [K5] . The soil K level that is considered adequate is production specific and depends on soil texture, the irrigation system, and on whether the tomatoes will peeled, diced or used for paste. Potassium availability affects tomato yield as well as fruit quality. Quality parameters measured depend on the use of the fruits. For paste production, soluble solids (SS) and color of blended product are the primary quality attributes. For products using peeled or diced fruits, the uniformity of the color is important. The color disorders of yellow shoulder (YS) and internal white tissue (IWS) are two important quality measures for these fruits [K8, K10]. Under drip irrigation, the yield expectations are higher and the root zone is more limited. For these reasons, a higher soil K availability threshold should be used than under furrow irrigation, especially when the field has a history of fruit color problems or low leaf K concentrations during fruit set [K12, K5]. An exchangeable K level of 135 ppm is generally sufficient for maximum yield and high quality fruits for paste production. For use as peeled or diced fruits, the exchangeable K level should be higher in order to meet the quality measures [K10, K11]. An adequate K supply may reduce fruit color disorders, but it cannot always eliminate their occurrence. Applying more K to fields used to produce peeled tomatoes is only economically favorable when a significant premium is paid for improved fruit quality for peeling [K10, K11]. Exchangeable K thresholds for different production systems (based on [K4, K5, K10, K11]). Potassium uptake also depends on factors that affect root density, such as soil physical properties and crop management [K10]. Very high magnesium (Mg) availability may induce color disorders, even when exchangeable K levels are sufficient. Hartz and coworkers recommended that the K√ Mg ratio (both expressed in cmol/kg) should be above 0.25 for the production of peeled or diced fruits [K10]. Nutrient concentrations of whole leaves are a more reliable measure of crop nutrient status than concentrations in petioles [K5], as petiole nutrient concentrations may change very rapidly, making them heavily dependent on the sampling time [K6]. The fourth leaf from the growing tip is generally sampled [K17, K20]. For a representative sample, 40 leaves should be sampled from a field or management unit. Samples should be placed in a clean paper bag and dried at a temperature of 140-160 °F [K17]. For more information on sampling procedure see Plant Tissue Sampling. The table gives the ranges of leaf nutrient concentration typical of high-yield processing tomatoes. The values were obtained with a survey of more than 100 commercial fields [K9]. Leaf nutrient concentrations within these ranges can be considered sufficient for the growth stage; the farther outside these ranges the measured concentrations are, the more likely it is that the nutrients are deficient or available in excess [K7]. Optimal leaf nutrient concentrations for high-yield processing tomatoes [K9] (To convert the concentrations to %, divide the numbers by 10). The optimal application rate depends on soil test values. The adequate soil K level in turn depends on the use of the tomatoes as well as on the irrigation system. Potassium availability affects tomato yield as well as fruit quality. When the soil test suggests insufficient K availability, the amount of K applied should ideally replace the K removed from the field with the harvested tomatoes, as lower application rates reduce the long-term soil K supply. Between 180 and 270 lbs K/acre (220-330 lbs K2O/acre) are removed with the harvested fruits with a yield of 45 tons/acre and a K concentration in tomatoes ranging from 4 to 6 lbs/ton [K7]. However, economic returns on the current crop may be highest with some 100 lbs K2O/acre, as the yield increase becomes smaller with each additional pound of K applied [K7]. Zhang and coworkers[K24] reported that the marketable yield of processing tomatoes under drip irrigation with a yield level of more than 50 tons/acre did not increase when the K application rate exceeded 175 lbs/acre (210 lbs K2O/acre). Contact your local farm advisor for more information. With very low K test values, the fertilization rate may be increased. To increase very low exchangeable K levels by 50 ppm in the top foot, about 180 lbs K/acre (220 lbs K2O/acre) are required, assuming that none of the applied K becomes fixed or is leached. For crops grown on soils that fix K, larger application rates may be necessary (see Potassium Fixation in the San Joaquin Valley). In K fixing soils, optimizing timing and mode of application may have a more pronounced effect on yield and quality than increasing the application rate . Pre-plant applications can be broadcast or banded on the shoulder of the bed to a depth of 6 to 8 inches. As the main tomato root system is at a depth between 4 and 16 inches, it is important to incorporate the fertilizer. In soils with a high K fixation potential, a band application, 6 to 8 inches deep, is more efficient than a broadcast application, as the contact with soil minerals is reduced. Tomatoes are moderately sensitive to chloride and salt [K18, K21]. Potassium sulfate is preferred over potassium chloride. However, potassium chloride can be used if it is applied before the start of vegetative growth [K16]. Applying up to 235 lbs K/acre (280 lbs K2O/acre) two weeks prior to transplanting tomato seedlings, Csizinszky[K2] found no difference in yield of tomato plants fertilized with either KCl or K2SO4. At 315 lbs K/acre, K2SO4 tended to be superior, however, the difference was not statistically significant [K2]. The fertilizers were applied in a band, 12 inches away from where the seedlings were planted. To drip-irrigated tomatoes, K is generally applied during the growing season by fertigation. To furrow irrigated tomatoes, K is most often added pre-plant. In sandy soils with a low cation exchange capacity, multiple annual applications may be required, as K can be leached. Split applications may also be beneficial in soils that tend to fix K.
Potassium is generally applied pre-plant, at sidedressing, or fertigated during the growing season [K22]. Common starter fertilizers contain N and P but no K.
When the soil test values suggest insufficient K availability, the K applied should replace the K removed from the field in harvested tomatoes, which may range between 220 and 330 lbs K2O/acre (for a more detailed discussion see Pre-Plant Fertilization). However, economic returns on the current crop may be highest with 100 lbs K2O/acre, as the yield increase becomes smaller with each additional pound of K applied [K7]. With very low K test values, the fertilization rate may be increased. However, in K fixing soils, optimizing timing and mode of application may have a more pronounced effect on yield and quality than increasing the application rate. In drip-irrigated fields, a team led by Tim Hartz found no difference in yield and fruit quality between continuous fertigation with 100 ppm K, and 5 weekly injections of 40 lb K/acre [K12]. With both treatments a seasonal total of 200 lb K/acre were applied during the four weeks following early fruit set. Both fertigation methods tended to be superior to a pre-plant K application. For furrow-irrigated tomatoes grown on soils that tend to fix K a banded sidedress K application may be more effective than pre-plant application [K22]. The fertilizer should be placed below the dry surface soil, as the mobility of K in the soil is limited and plants have restricted access to K in dry surface soil [K14]. Tomatoes are moderately sensitive to chloride and salt [K18, K21]. With the amounts generally added during the growing season, chloride and salt effects are not expected in soils that do not have any salt issues. Potassium sulfate has a low solubility, limiting its use for fertigation [K1]. Nutrient uptake is slow until fruit set begins. Up to this point, the crop’s K demand can generally be covered with soil available K [K7]. From early fruit set until fruit begin to ripen, nutrient uptake is high and relatively constant rate. Therefore, sidedress K should be applied before early fruit set, from prebloom through early bloom [K22]. Fertigation with K is most important between early fruit set and fruit ripening [K12]. Crop nutrient uptake slows in the final 4-6 weeks before harvest, with the fruit drawing nutrients out of the vine; in most cases it is unnecessary to apply fertilizer during this final period, except when fruit quality is a concern [K5, K12]. Little data about the effects of foliar K applications on tomato yield and quality are available. Hartz and coworkers reported using K2SO4 for weekly applications of 6.4 lbs K/acre applied with 16 gallons per acre starting during fruit setting [K12]. In fields with soil exchangeable K levels of 0.85 cmol/kg (=300 ppm) foliar application had no effect on yield or fruit color compared to the unfertilized control [K12]. Under drip irrigation, the need for foliar K is even further reduced than under furrow irrigation.